Is that boy coming out of the pie?!? Text: Really Thick Mince Pies! There's no pride or pleasure in a pie unless it makes the mouth water — unless its goodness fulfills your expectations. Mouth-melting pies of this sort are made with Atmore's Mince Meat. Sun-Maid Seedless Raisins and Fruits in Atmore's expand and absorb the rich juices. Your oven produces a thick pie that's a revelation. Housewives: insist on Atmore's. No sugar or "extras" needed. 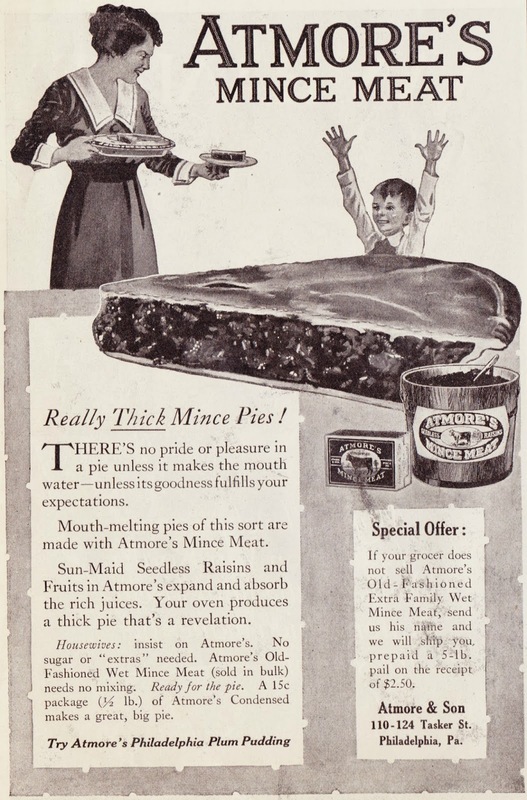 Atmore's Old-Fashioned Wet Mince Meat (sold in bulk) needs no mixing. ... Try Atmore's Philadelphia Plum Pudding.